Thank you David. This podcast is so informative. Easy to listen to and follow. I’ve shared it around. Ditto to Wendy Boutilier. Unable to help financially due to onset of pancreatic cancer. 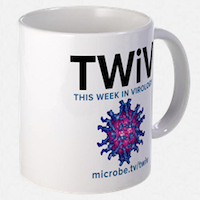 Thanks to David Tuller and Vincent Rancinello at TWIV the truth will be in the science. Real science not fake science. Thanks so much, guys. The tide does seem to be turning (thanks in large part to you), but it’s a slow process. Thanks for your tenacity, David. I still haven’t found time to listen to this, but wanted to thank both of you in advance for all of your work. There’s now so much critical coverage of PACE that it’s getting difficult to keep up with it all, and I’m sure that it is very largely thanks to Dr Tuller that patients’ long standing concerns are finally getting some of the attention that they deserve. 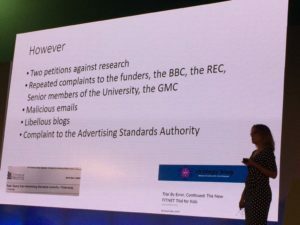 So long as so many of those involved in medical research are able to go on evading difficult questions about their work, misleading and harmful claims are going to go on being spread. Hopefully PACE will become enough of a scandal that it will help bring about wider changes in the way that science (particularly in the UK) works. FITNET (CBT) and MAGENTA (GET), funded and recruiting. No objective outcomes. Weak entry criteria ie chronic fatigue not chronic fatigue syndrome. David, thank you for continuing to be so generous with your time and abilities. It has been hugely encouraging to follow how you have enabled the truth to be exposed among the international scientific community. I am very happy to have been able to support your Crowdrise campaign (https://www.crowdrise.com/virology-blogs-trial-by-error-more-reporting-on-pace-mecfs-and-related-issues1) and very much hope you will be able to get through the British media and force the hand of our medical establishment in the coming year. Glad you are standing up for the truth for us that suffer with M.E as too ill to keep fighting ourselves. Thank you for sharing the truth. My above reply under Wendy Boutilier seems a little inappropriate by saying real science vs fake science when I actually wanted to say flawed and fraud regarding PACE. If my comments don’t make sense please don’t post. Cognitive problems worse now undergoing chemo. Btw ME is worse than pancreatic cancer imho.